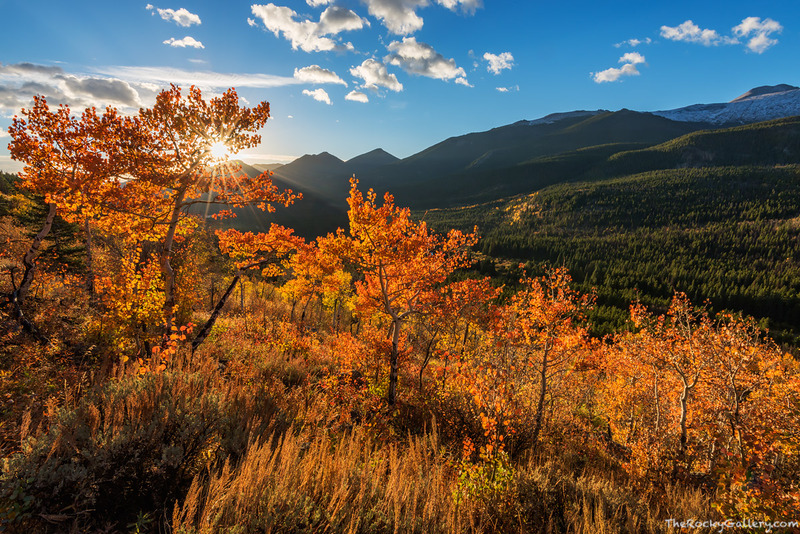 Bierstadt Moraine, high above Bear Lake Road in Rocky Mountain National Park is a great location to photograph and view some of the best autumn colors in all of Rocky. Aspens line the Moraine and the views from the trail are equally impressive. On this cool autumn morning, the sun rises over the ridge to the east and illuminates these beautiful orange aspen trees and bring warmth after the dark of night. During the fall season most aspens will take on a golden yellow, some however, will turn a vibrant orange as these trees did. Photo © copyright by Thomas Mangan.